Featheredge cladding is also known as weatherboarding or feather-edge boarding and it is a traditional means of cladding homes. It is simply a sawn board cut on the diagonal to produce a tapered board that is overlapped when fitted, similar to roof tiles. Designed to be laid horizontally, it is important to make allowances for at least a 35mm overlap on each board (50mm is best) when making your calculations. If your boards are exposed to varying weather conditions before fitting, they are likely to cup, warp and split; the ideal time to fit cladding to keep this to a minimum is between the months of October and April and within 7 to 14 days of delivery. It is of the utmost importance to follow fixing guidelines when fitting your cladding, due to the natural characteristics of the timber used. It is recommended that the fine sawn face of the board is exposed as opposed to the planed face, this will not only give you that traditional featheredge finish, but will allow the timber to accept and retain any treatment, thus keeping future maintenance of your cladding to a minimum. Traditionally oak cladding was used but more recently other species have proven to be both durable and popular due to sometimes significantly lower costs. Here you will find Oak, as well as English Larch, Siberian Larch, Treated English Softwood and Black Painted Kiln-Dried Whitewood featheredge boards in various section sizes, suitable for applications in both residential and commercial settings. 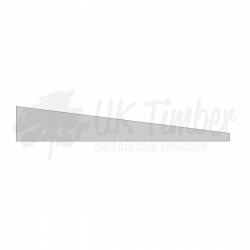 Similar to the featheredge cladding profile, Rebated Featheredge is a sawn board cut on the diagonal to produce a tapered board that is overlapped when fitted, similar to roof tiles. Our rebated featheredge boards are rebated to enable the featheredge to fix flat for additional stability and improved weather resistance. 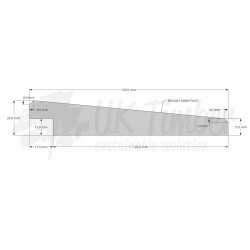 Designed to be laid horizontally, it is important to make allowances for at least a 35mm overlap on each board (50mm is best) when making your calculations. Using rebated feather-edge horizontal boards for cladding, it is possible to reduce the overlap to 25mm but you should have a 2mm gap to allow for possible expansion of the boards. If your boards are exposed to varying weather conditions before fitting, they are likely to cup, warp and split; the ideal time to fit cladding to keep this to a minimum is between the months of October and April and within 7 to 14 days of delivery. It is of the utmost importance to follow fixing guidelines when fitting your cladding, due to the natural characteristics of the timber used. Traditionally oak cladding was used but more recently other species have proven to be both durable and popular due to sometimes significantly lower costs. 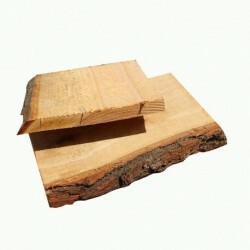 Here you will find our range of Rebated Featheredge Cladding in various section sizes and species at affordable prices. Shiplap cladding is the perfect profile choice should you require not only excellent weather protection, but clean smooth lines and a smarter finish for your cladding project. Commonly fitted horizontally, once in place the visually pleasing shadow lines will accentuate the length of your building and offer a uniformed appearance. Suitable for both contemporary and traditional applications, in both residential and commercial settings, the shiplap profile is predominantly used on new-builds or on extensions to older properties. The Half Lap Cladding profile is the perfect choice should you require a clean linear appearance as well as impeccable weather protection. 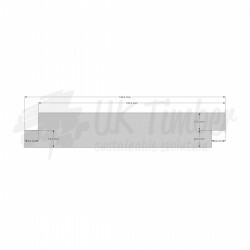 Unlike a shiplap profile, with its distinctive shadow lines once fitted, the half lap profile offers a smoother finish with a slimmer shadow gap making it ideal for use on contemporary builds or extensions to an older property. If you're looking to achieve that effortlessly classic 'T&G' look, we are certain that our high quality V Tongue and Groove Cladding options will make it an easy choice. Just like the classic T&G profile, these boards are fixed together by inserting the tongue into the groove. The chamfering at the top and the bottom of the boards accentuates the individual boards by creating a subtle 'V' shadow line along the joints. What makes this profile different from the Tongue and Groove profile is that these boards are reversible so either face can be used. Dependent on your style, they can also be fitted either horizontally or vertically; should you choose to fit them horizontally, it is recommended that the boards are installed with the tongue uppermost, this is to allow any moisture to fall away from the tongue. 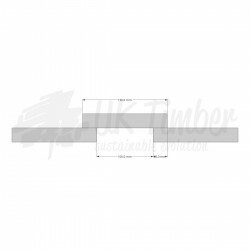 Available in Character Grade Oak in various section sizes, we are sure to have an option to suit. Milled on site with hand selected materials, our Tongue and Groove Cladding Boards will make light work of achieving that classic 'T&G' look. These boards are fixed together by inserting the tongue into the groove. The chamfering at the top and the bottom of the boards accentuates the individual boards by creating a subtle 'V' shadow line along the joints. Dependent on your style, they can be fitted either horizontally or vertically; should you choose to fit them horizontally, it is recommended that the boards are installed with the tongue uppermost, this is to allow any moisture to fall away from the tongue. Currently available in Siberian Larch, other options will be coming soon! Rain Screen Cladding, otherwise known as Splayed Cladding is rhomboid shaped boards that will form when fitted a modern timber façade by equally spacing the boards apart on top of a waterproof membrane. 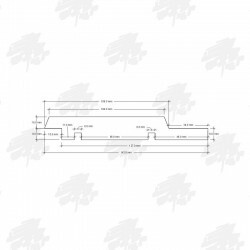 As the boards are not interlocked, the use of a waterproof membrane is essential. Both a sustainable and a cost effective way of protecting and maintaining a wall, this profile is ideal for new builds as well as renovating older buildings due to its ability to help with insulation, damp and moisture problems. As well as practical benefits, there are also aesthetic ones - commonly fitted horizontally, you also have the ability to fix this profile vertically or even diagonally so that the bold shadow lines lie in any direction you wish, ultimately creating a stunning exterior feature wall. 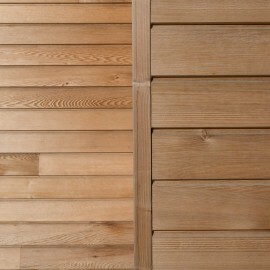 Currently milled on site using handselected Siberian Larch, other options will be coming soon! Board on Board Cladding, otherwise known as Board and Batten Cladding is an incredibly cost effective and versatile cladding option. 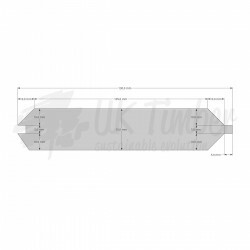 With this profile you have a choice of different sized shadow lines and whether to fix the cladding horizontally, vertically or even diagonally! Suitable for a vast array of applications, it is quick and easy to fit without compromising on its practical and aesthetic benefits. The Channel Siding profile will not only offer you impeccable weather protection, but a striking uniformed appearance with its definitive shadow lines once fitted. 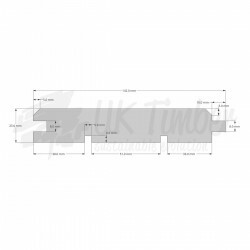 Commonly fitted horizontally, once in place the visually pleasing shadow lines will accentuate the length of your building and will give you that contemporary uniformed appearance you're looking for. Suitable for both modern and traditional applications, in both residential and commercial settings, this profile will make light work of adding a stunning finish to any building. Our Bevel Siding Cladding is produced by resawing an already sawn board on the diagonal to produce a tapered board that is overlapped when fitted. 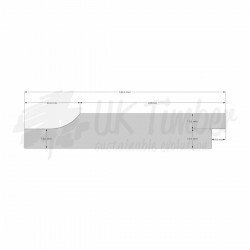 Not to be confused with our featheredge profiles in that the slight notches to the top and the bottom of the board will create an attractive small 'V' shadow line that will accentuate the length of your building. 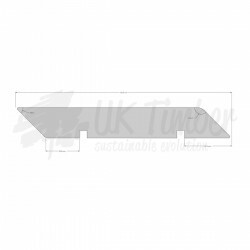 Designed to be fitted horizontally to give you an attractive shadow line, the rebate will allow the boards to lay flat once fixed for additional stability and improved weather resistance. If your boards are exposed to varying weather conditions before fitting, they are likely to cup, warp and split; the ideal time to fit cladding to keep this to a minimum is between the months of October and April and within 7 to 14 days of delivery. It is of the utmost importance to follow fixing guidelines when fitting your cladding, due to the natural characteristics of the timber used.